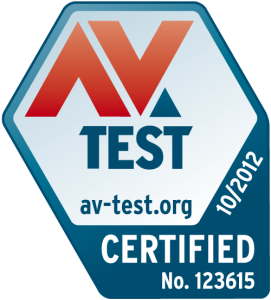 Avast Software received an "AV-TEST CERTIFIED" seal for avast! 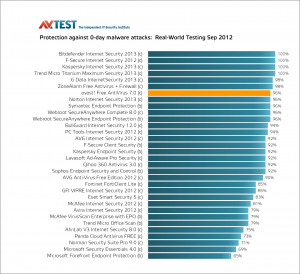 Free Antivirus in the latest test-round from the AV-TEST Institute, an independent testing lab in Germany. Avast! Free Antivirus detected 100% of widespread and prevalent malware (such as viruses, worms or Trojan Horses), and its cumulative score earned it the top spot for overall performance among other free and a number of paid-for solutions competitors. During September and October 2012, the Institute evaluated 24 home user and 8 business internet security products covering a range of metrics, including protection against ‘real-world’ zero-day malware attacks ( very simply, a previously unknown vulnerability) , detection of a representative set of malware discovered in the last 2-3 months, false positive rates, and scanning speed. The results in three tests for detection of malware were outstanding, especially in a field crowded with paid-for alternatives. Avast! Free Antivirus was equal to expensive security suites and outshined the majority with a score of 100% in October “real-world” detection rates, and achieved a perfect 100% in tests to detect widespread malware. The AV-TEST Institute used the most current publicly-available version of all products for the testing, with the notable exception of Windows Defender for Windows 8, which will be tested at a later date. Microsoft Security Essentials (MSE) was tested and fell further behind, continuing the poor performance showing for 2012. Avast! 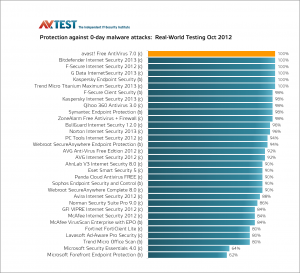 Free Antivirus surpassed MSE in all 2012 monthly real-world tests. While it does a good job on common widespread malware, as do most good brands, MSE lacks the cutting edge protection against new unknown “zero-day” attacks of which avast! Free Antivirus excels in detecting. The AV-TEST certificate is an internationally recognized logo that confirms that the tested version of the certified IT security software met the extremely high quality standard of the AV-TEST Institute at the time of testing.